We love bands that are inspired by the sand beaches and beautiful vistas of Hawaii, so it’s no wonder we chose to feature these three rings next. 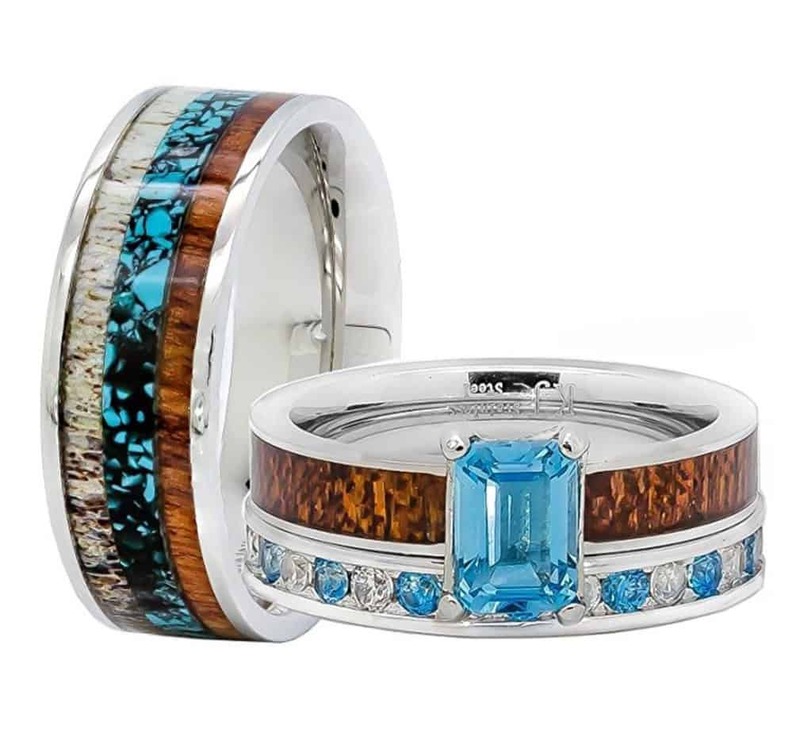 They have stunning inlays of koa wood as well as turquoise. It’s a great contrast. Acacia koa wood is a tree that’s actually in the pea family. This tree is found in the highest populations in areas like Maui, Hawaii and Oahu. It’s similar to black walnut, but it is actually considered a tonewood, which makes it great for instruments like guitars and ukuleles. In the Hawaiian language, koa means brave, fearless and bold. The grain of the wood is normally wavy and coarse in texture. The beauty of the wood is in the wavy lines and contrasting colors in the streaks that resemble ribbons. It’s often compared to mahogany in color and texture, too. 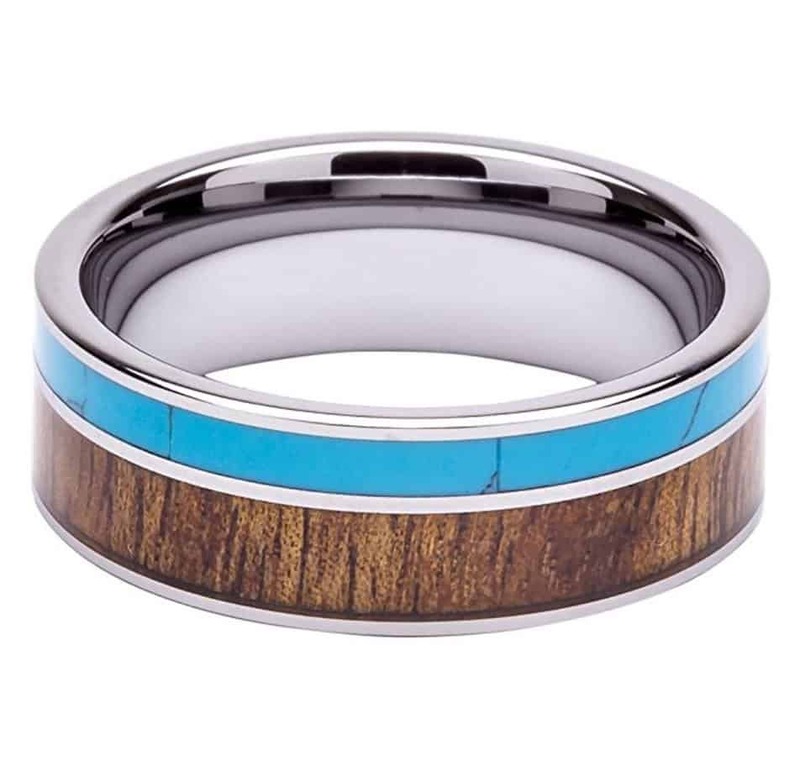 This band has a width of 8 mm and features inlays of both turquoise and koa. We love the contrasting inlay bands of color that play against the silver of the tungsten. The ring has a highly polished exterior with a rounded interior for a great comfort fit. The manufacturer of the ring provides a 1 year limited warranty, but a 30 day 100% money back guarantee with this koa band. This takes the uncertainty out of purchasing since you’ll be able to return if there’s a problem. There’s a hefty weight and width to this ring that makes it a perfect gift for the man in your life. Especially if he works in construction or is rough on his rings. Tungsten can take a beating. The koa wood and turquoise ring is made with natural materials, so each ring will have a slightly different look. This is a plus in our book. Instead of getting a ring exactly like someone else, you’ll be getting an original, one-of-a-kind piece. Rings made of ceramic are great for those who have some allergies to metals. Many people choose wood for its hypoallergenic qualities, and this ring has both of those materials in it. 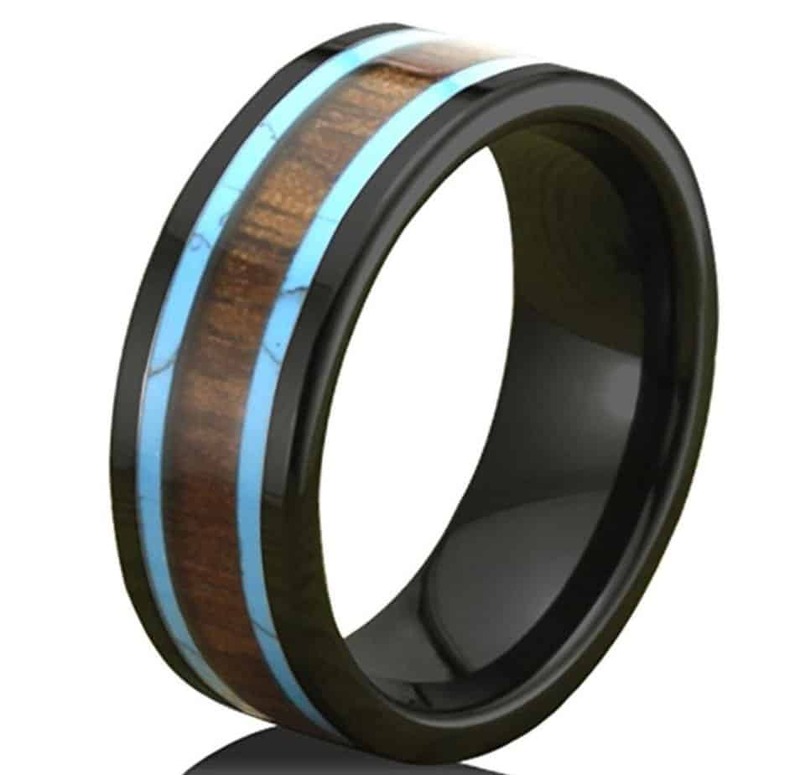 This ring features two solid lines of turquoise inlay surrounding a middle of koa wood. There’s definitely a glow to this ring when it’s seen in person. It makes a great wedding band for couples who want something a bit unique. Ceramic is resistant to scratching and fading over time. It’s a terrific ring for anyone who loves these materials and needs a ring that won’t cause a reaction. The thin strips of turquoise practically shimmer next to the dark koa and black ceramic. We love this ring because it’s stunning enough for women while being suitable for men, too. It’s a great band to purchase as a wedding set or for your anniversary. We saved the most unique pieces for last. While the others have made accommodations for it to be considered a wedding band set, this set of rings is truly a wedding set. Her set features a beautiful, natural blue topaz solitaire. Under the solitaire stone is a band of koa wood inlay in beautiful koa wood. The second band has a channel of blue topaz stones and CZ stones for a complete wedding set. The surgical steel has an overly of rhodium for shine and protection. The band for him has three strips of inlay. One is the shed antler from a deer. The middle strip is turquoise and the outer edge is koa wood to match her ring. If you love hunting, this is a great choice for your wedding set. Even if he loves hunting and she doesn’t, she can’t object to a deer antler that’s already been shed being used in his band. When wearing these bands, everyone will ask about the material inlay, and it’s almost a guarantee that your neighbor or co-worker won’t have rings like these. These rings are ones we chose for their unique beauty with stunning designs of koa wood and brilliant turquoise. We believe that if you’re looking for rings that truly glow with the love you have for your significant other, these are the rings that truly express that love.